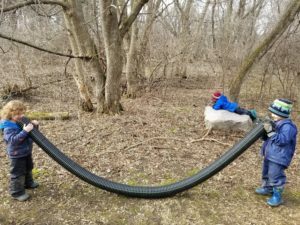 It’s that time of year again – winter has come and gone and another Minnesota spring is upon us. This inevitably means that spring fever is setting in and thoughts of the future are clouding my brain! The itch to think ahead and immediately jump into the next thing is ever present. I almost find myself wishing away time – I’m anxious and excited for summer sunshine and new projects. It also means the end of the school year, which is jam-packed with activities, conferences, and limited time to spend with our students, many of whom will be off to new adventures next year. To say the least, I am finding it tricky to stay in the moment, and I’m not the only one. 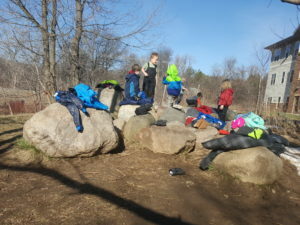 The children are feeling the spring itch, and it translates into the classroom. Things that used to be engaging for most kids, making popcorn or playdough for example, don’t have the same appeal they once did. 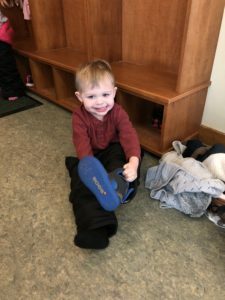 Some children are also nearing the end of their second or third year of preschool, and as much as I may not want to admit it, they’re ready for a change! Dare I even say it – they’re bored! This has got me thinking, what does it mean to be bored, and is boredom a bad thing? To piggy-back off of Jenny’s most recent blog, we live in a an age where screens and immediate gratification dominate our lives. We’ve become so accustomed to having everything at our fingertips. I am as guilty of this as the next person; we don’t know how to handle moments of boredom. If our brain isn’t experiencing continuous stimulation, we feel uncomfortable. But, feeling bored has led to my most creative moments! The same can be said for children, and nature-based play is the perfect example of this. When children are put into a less-structured environment with open-ended materials, they have the opportunity to use their creativity and imagination. Imagination is vital to play, and play is “the work of childhood,” as beautifully stated by Fred Rogers. While we strive to keep children engaged, interested, and learning, it is also just as important, to help them problem solve and make discoveries on their own. We should not be afraid of our kids feeling bored at times – this is good for developing brains. We all need to struggle, make mistakes, and grapple with feelings of discomfort in order to be comfortable trying new things, taking risks, and getting creative! As our school year comes to a close and you’re feeling overwhelmed with end of the year to-do list, summer plans, and whatever else might by clouding your brain, remember to slow down and value the present. During a time of transition, struggling with the uncertainty of what comes next is normal. We don’t need to rescue children every moment. Challenge your child to look for new ways to play and tackle problems. 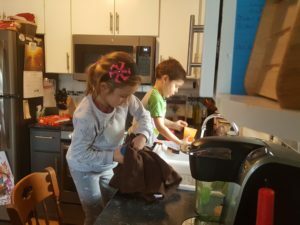 All the while, know that we are there with you, continuing to scaffold popcorn-making into a deeper lesson about counting to help your child get ready for the next thing. Big changes are around the corner; we will get there and it will be glorious! For now, let’s enjoy our time together and embrace the process! It all happened one day at my daughter’s gymnastics class, another event where my then three-year-old son was taken along for an activity that did not involve him. 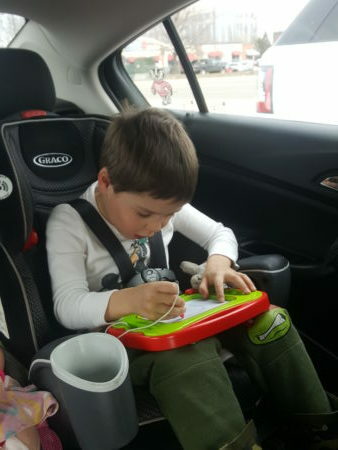 As usual, I brought along his backpack full of books, toy cars, and a Magna Doodle. I noticed early in the class another dad watching us, as I alternately read a novel and watched my daughter’s not-quite coordinated attempts at somersaults and cartwheels. My son was engrossed in his take-along bag. I am not sure that anyone believed me when I reassured them that, no, I really don’t own a tablet and only under the direst circumstance do my children get to touch my phone. I do not have any apps for children on my phone. I do not have Netflix on my phone. A caveat to this blog: I am not the “all-screens-are-evil” hippie that these parents may have assumed me to be. My children watch cartoons on weekend mornings, when they are sick, or when they just need a short break but don’t nap anymore. Almost all are shows that can be found on PBS. We frequently take five hour road trips where my children must agree on a movie to watch during the second half of the drive. We love a great family movie night complete with pizza or popcorn. However, my husband and I expect our children to entertain themselves, observe their surroundings, or engage in conversation with us while waiting for something. This is something we have expected from day one. This is something we try and model to them whenever possible. That, I believe, is the real kicker. In a restaurant, we play “I Spy” games, or “I’m thinking of an animal,” or make up stories as a family. At the grocery store, the kids are responsible for holding the list, helping remember what is on it, and deciding which kinds of fruit to buy. 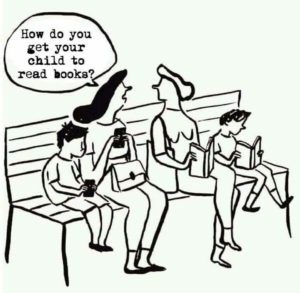 We bring books to the doctor’s office or children’s lessons and let our children see us reading instead of letting them see us playing on our phones. As our young children become more literate, easy word searches have become my new favorite portable activity to keep them quiet and settled when necessary. Screen time is not my favorite conversation these days. It seems that we all recognize the negative effects it can have on young developing minds, yet it is often treated as a necessary evil to “get through” something or to have peace and quiet. We are stressed adults, and do deserve a break and a bit of quiet. But we might have to wait to go on our screens until after bedtime. Then, by all means, break out whatever device strikes your fancy. And of course, there are many children with special needs and challenging behaviors who use devices on a daily basis for communication, for token reward systems, and for educational purposes. I don’t believe there is a one-size-fits-all model. What I’m encouraging is mom and dad to put down their phones. Put away the tablet. You do not habitually need that crutch. Strike up a conversation. Sing if you have to! (Or in my case, because, why not?) 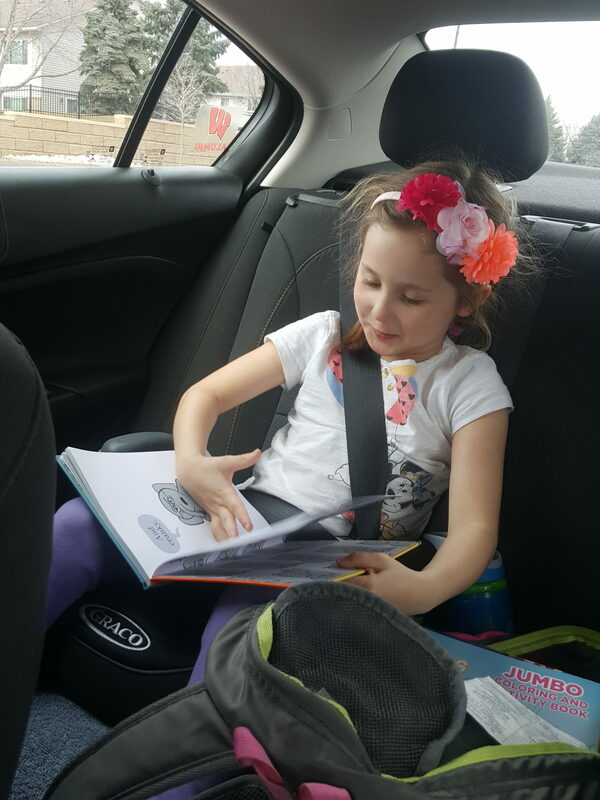 Pick up a book or a coloring book. Let them see you doing the things you want them to be doing. I promise you will be rewarded for your efforts. I loved hearing that, since creating a home-like space was very intentional as Amy and I planned the school ten years ago. A child’s first school experience should be as easy a transition between home and the big world as possible. Our environments and our teachers contribute to that in many ways. The small size of our school is an asset, with each child known by every adult, just as in an extended family. The teachers need a home away from home, too, with healthy relationships. I’ve always felt that a good teaching team resembles a good marriage; communication is easy–verbal and non-verbal–trust and forgiveness are there, as are good problem solving skills and creativity. 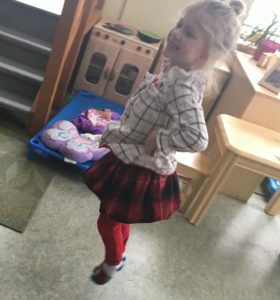 When things go well, teachers experience the fun and pleasure of preschooler’s company. When we face struggles, we support each other, talk honestly about the challenges, and learn from each other–and the children. I have experienced this “family” in other school settings, but never in the way I have here. 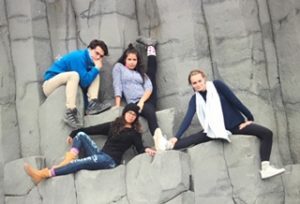 Part of what makes All Seasons unique is the presence of the seniors. The sadness of losing special grandmothers or grandfathers never completely goes away, but it’s always tied to the gratitude of having known these dear people. I am a grandmother (Thomas, 9 and Owen, 12). The preschoolers think it is very silly when I sit in the drum section with the other grandmothers for rhythm band in the Community Room, clearly trying to wrap their heads around my dual role of teacher/grandmother. 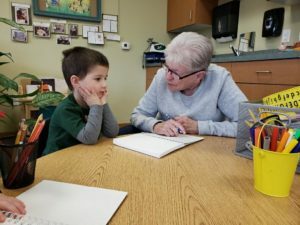 I have learned some important things from the children and the seniors about being a grandparent. Since my grandsons live far away in Utah, I don’t see them often. When we are together, I have felt pressure to be the very best “Grammy” I can be with the limited time we have. 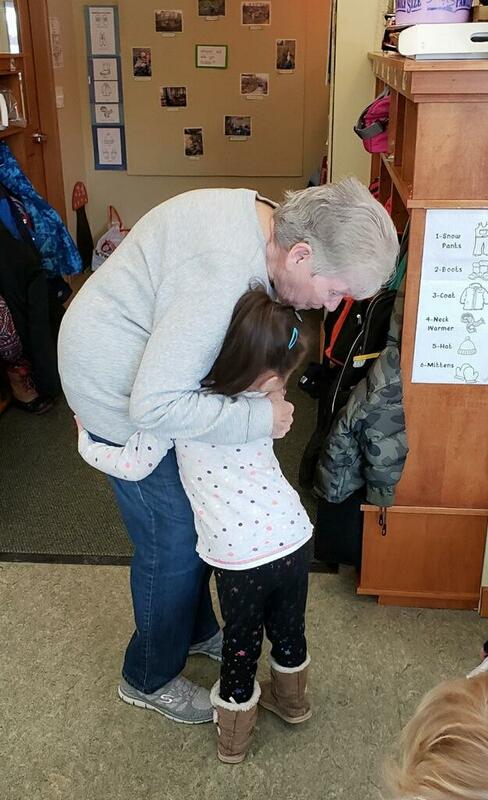 But I have finally started to internalize the magic of what Inver Glen seniors bring to our children—their attention, their time, hugs, laughter, love. I know I get those very blessings from my grandsons, and I have to trust that is enough of a gift from me to them. This matter has been bubbling inside me for years. It is likely I haven’t written about adoption because I am hesitant to discourage people from expressing curiosity about my family. While it is private, adoption is not a secret or something to be ashamed of – there is a difference between private and secret. I’m proud of my family and how we created it. But there are ways to discuss adoption and words to use (and avoid) that allow opportunities for conversations that are sensitive to my children and me. Courteous discussion depends on knowledge and sensitivity. 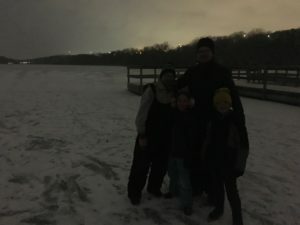 I write this, confident that “When we know better, we do better.” It is fair to say that most people are unfamiliar with the vocabulary that demonstrates sensitivity to my family. Because the people I know would never intentionally say anything they thought might be hurtful, it has been rare for me to be offended by people’s questions and comments. However, there are phrases that are outdated and insensitive, best intentions aside. My family is unique because we have two children who are adopted from Colombia and two children who are biological. Additionally, our family grew in an unconventional order; birth, adoption, birth, adoption. Surprisingly, my daughter by birth is the one who was typically assumed to be adopted since she “didn’t match” physically with her blond hair and fair skin. I remember being surprised that people would ask me if she was “really” mine. “Is that your REAL daughter?” “Yes. All four are really mine.” When people say “real,” the word they’re looking for is “biological.” Treating adoption as a consolation prize is common and very upsetting. “Oh, were you not able to have your own?” Again, they are my own. They are not biological, but they are very much mine. And while unintended, questions like these imply that adoption is a second or third choice. Families are created in many ways. Adoption is one of those ways. Don’t ever tell a child or communicate that they are “lucky” or “blessed” to have a family. I am not their savior and while gratitude for many things is desirable, no child should ever receive the message that they should feel grateful to have a family or that they were “saved” by their own parents. Gratitude for a family is something that would never be expected of a biological child – that their parents did them a favor by allowing them to be part of a family? Had it not been me, there would have been dozens of others wanting to become parents to my girls. Any language objectifying a person is offensive, even if that is not the intention. An common example is, “Where did you get her?” As with anyone who might not be from here, you would ask, “Where is she from?” “She looks like a china doll,” is one I have heard multiple times from parents who have adopted children from Asia. While meant to be a compliment indicating physical attractiveness, it is not. “She’s beautiful” would be more appropriate. Casually tossed out questions or comments in front of my children can be hurtful. “I could never give up a child,” is insensitive. No, you couldn’t because you have never been in a situation where you had to make that decision. “Do you have any information about their real family?” (Again, don’t say “real.”) I do have information, but that is my child’s information, not mine to share. “Why were they given up?” If you think about this for a moment, any possible answer to this question is incredibly private and not information I have the right to share. What potential scenario would constitute carrying a child for nine months and then placing it for adoption? Every possible answer would be confidential. Discretion aside, please ask me about my family. I am a proud mom and will happily tell you about all four of them! Many parents ask me how we handle getting ten toddlers outside in the winter. It’s true that it isn’t easy. Many days it takes longer to get them dressed than we spend outside. We call in help from Amy, Tracy, or Sarah when we can. But like any skill a child must learn, dressing oneself for outside is a skill that slowly builds. Perhaps one day a child can take off their own shoes or put on their own boots. Perhaps they figure out how to get their hat on correctly, or take their snowsuit off the hook in their cubby. The ability to dress oneself for outside it not a simple box to check, but rather made up of many smaller tasks that build upon one another. A visual aid is posted on the classroom wall for the children to refer to as they dress. This helps with sequencing — snow pants must go on first, mittens must go on last. We also do a lot of coaching, step by step. Sit down… put your feet through your snow pants… stand up… put your arms through the straps…zip up the zipper… is often what it takes. “Put on your snow pants” is too vague and doesn’t help with the HOW of it all. Another key piece is time. We never rush out the door in our class. Those who get ready quickly go outside to play sooner, but those who take longer are allowed the time. 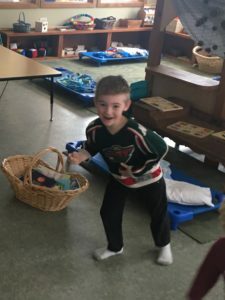 Rushing the process doesn’t help the children learn any faster, and while we love to play outside, there is equal value in giving children time when they are so often rushed. Perhaps the mantra that comes to me most often as we are working through this process is let them struggle. It’s okay for it to be hard and frustrating. It’s okay to have to try over and over again. It’s okay if today you can’t; maybe next time you can. 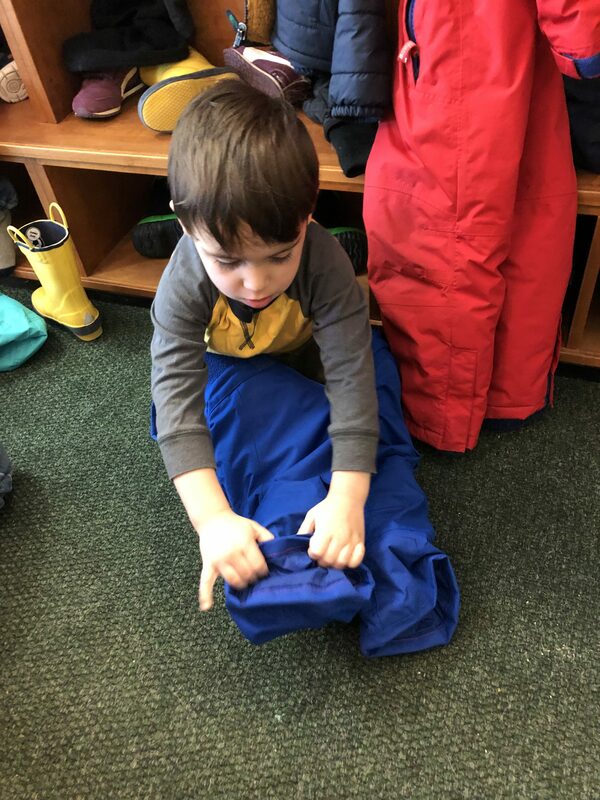 When we swoop in and rescue kids from these moments of safe struggle, we deny them the opportunity to learn not just how to put on their snow pants, but how to cope with frustration and develop persistence. We want to send the message to the children that we believe they can do this, if we only give them the time. It’s about much more than snow pants. I don’t know how transitions go at your home, but at my home (and at All Seasons), they can be a little hairy. Young children often have a hard time stopping one activity to begin another. 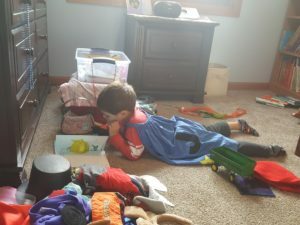 Even with 5-minute warnings, countdowns, and visual cues, children can get frustrated being told to move to the next game, activity, lesson, chore, or heck, even the next aisle at Target! All the teachers at All Seasons also use music and special songs to help with transitions. 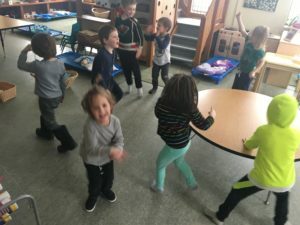 When group time starts in the Autumn Room, the teachers lead a song that begins with saying hello to friends and ends with everyone sitting down. The Spring Room uses made-up transition songs like “Come on over here” to gather children for directions. Even the youngest All Seasons students in the Winter Room know that when they hear their name in the dismissal song, it’s time to go. One of the trickiest parts of the day at All Seasons is the transition with the all-day students from lunch (high energy) to rest time (desired low energy). Like a group of adult friends eating lunch together, the children are excited to share stories, tell jokes, and have downtime with their friends. And this is great for social development! But the hardest part comes when we move to the resting room right after lunch. Kids are still wired and chatty. The mood doesn’t immediately turn restful. Staggered entrance to the resting room, which depends on when children finish eating and cleaning up, doesn’t help the transition as everyone is busy looking to see who comes in the room. One day on a whim, I decided to play some Beatles music as the preschoolers entered the room. I encouraged children to dance to the music. I set guidelines about what the dancing should look like: dance alone, no lying down, stay on the floor, jumping is ok, and most importantly: HAVE FUN! a bit of high energy dancing is the perfect transition to resting. The children are eager to come to the resting room on time so they have a chance to dance. They get some of their wiggles out so lying down is easier to do. 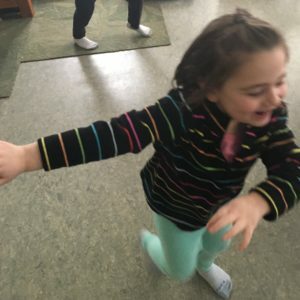 They have fun — and get to hear fun music! So far we’ve danced to “Twist and Shout” and “Birthday” by the Beatles, “ABC” by the Jackson Five, “Hound Dog” by Elvis,” and “Dance to the Music” by Sly and the Family Stone. The rest time dance parties may just be an excuse to work my way through my favorites in my music catalog, but it’s working transition magic I didn’t expect! And we sure have some kids with awesome dance moves at All Seasons! Knowing where to sit in a communal dining room is intimidating. Think back to grade school, middle school, high school, perhaps college. What about stools at a bar, and even picnic tables at a reunion. One would hope it gets easier, but residents in senior living aren’t immune to hesitation. 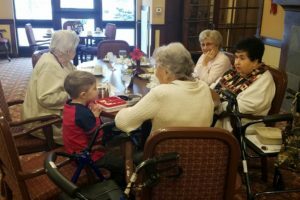 It took time, but the seniors at Inver Glen have found their regular seats. So imagine showing up with multiple preschoolers looking for places to sit and eat lunch alongside their beloved grandmas and grandpas! We looked for friendly faces and asked if there was room at the men’s table. With a little startle, they moved around water glasses and menus and created spots for chairs to be added. 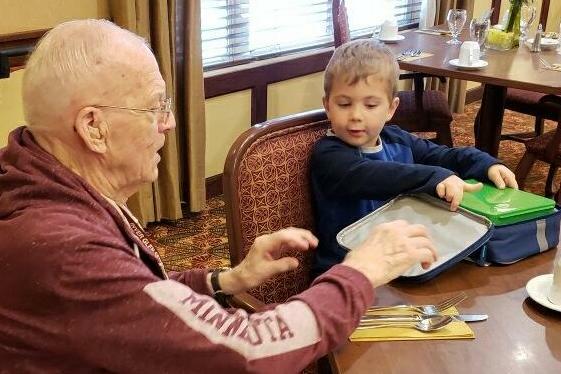 It was quiet while the children pulled out their lunch boxes, but at the first sign of a struggle, the grandpas were there – offering to help open Tupperware and passing napkins to wipe mouths. And so the lunches continue. Not every day, but just frequently enough to keep it special. The residents’ requests for company at their tables keep coming. One teacher brings three to five children at a time. They look forward to their turns to eat with the seniors and are prepped with encouragement to converse. Stories from their peers, such as when a grandpa shared his lemon meringue pie certainly helps build up the excitement! When I came to interview for this job at All Seasons Preschool, it was a warm August day. My family had just come back from a week in Tennessee exploring the Great Smoky Mountains. I had spent the summer going for walks and runs along the Mississippi River near my home in St. Paul. My daughter and I were looking forward to Girl Scout camp that coming weekend. I was riding high on summer-loving. So when Amy and Sarah Sivright talked about going outside every day and exploring all the different areas of the property, I couldn’t have been more excited. I have a confession: winter is my very least favorite season. I don’t like being cold. I don’t like scraping my car windows (I don’t park in the garage). I don’t like driving in snow. I don’t like how dark it is ALL THE TIME. I have awful memories from my childhood of putting my feet in bread baggies and then in my boots so my feet would stay dry (spoiler alert: they never ever did!) and snow crusties forming on my cold, raw wrists. I don’t ski; I don’t skate; I don’t play hockey. My preferred winter activity involves hot cocoa, a fuzzy blanket, and a good book. Needless to say, this winter at All Seasons has been an adjustment. At first, I was worried I wouldn’t live up to my job interview. Would Amy or Sarah or the teachers find out that I don’t like winter and rethink their hiring me?? Would the cold and snow cast a shadow over the things I love so dearly about working with children? Would I even survive!?!?? Like when our families enroll here, I had to do some shopping for the right equipment. I didn’t own a warm winter coat (mine was sufficient for walking from my home to my car), snowpants, or a neck warmer. I had to dig into my storage bins for boots and warm mittens. But you know what? With the proper gear, the winter hasn’t been too bad! It is true what they say: there’s no bad weather; only bad clothing. Over the winter holiday break, I even used my snowpants and boots for some outdoor activities. 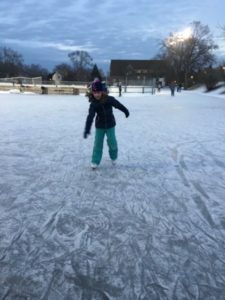 My eight-year old daughter, a true Minnesotan, loves cold and snow and skating and sledding and being outdoors in the winter. I decided to go along with her desires. 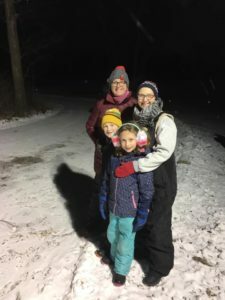 We went ice skating at the community rink near our house. She’s a whiz at it. I just hobbled along. The most “out there” winter activity we did over break was a candlelight hike on New Year’s Eve at Fort Snelling State Park. In years past, I don’t know if going outside, in the dark, in the bitter cold winds, on New Year’s Eve would have been on my radar, but I like to think working at All Seasons had a bit to do with my gumption. My husband, daughter, son, and aunt (visiting from Belize, of all places!) bundled up in every bit of winter clothing we could find. Extra hats, scarves, boots, snowpants, and mittens came out of storage. In fact, we were so bundled that we all began to sweat on the short drive to the state park. The hike was beautiful. We have been to this state park in the city often in the summer, but never in the winter. 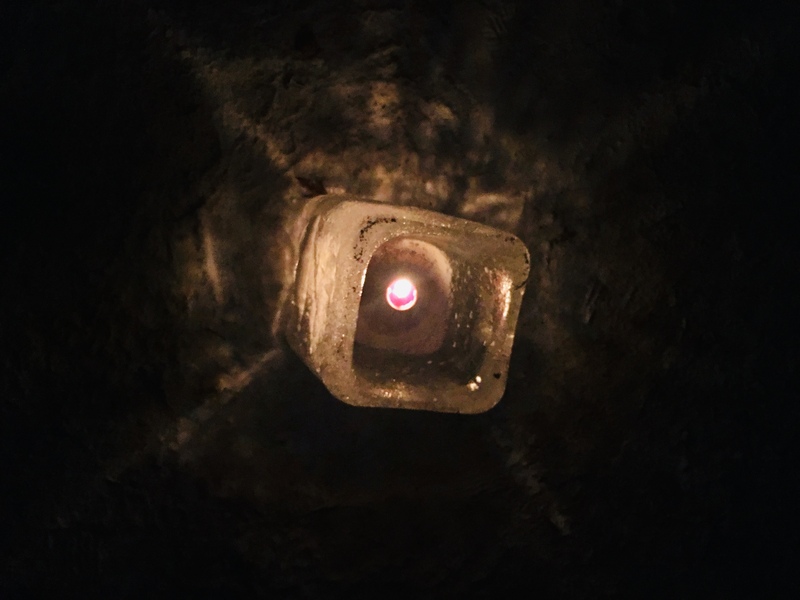 The park rangers had lined walking paths with candle luminaries – some even made out of ice! There were bonfires and s’mores and hot cocoa along the way. We even walked out on the frozen lake (a first for most of us!). In all, we hiked about three miles that night. And only in the cold crosswinds did any of us complain about being frozen. My winter-loving daughter was in heaven. My snack-loving son found joy in the s’mores. My Kansas-born husband remarked he never did anything like this growing up. My Central-American-living aunt exclaimed she couldn’t wait to tell her friends back in Belize what she did on New Year’s Eve. And as for me, I found joy in winter, all bundled in my new snowpants and coat, hiking in my warm winter boots, wrapped up in a scarf my mom made. The beauty of the night and the freshness of the New Year ahead overpowered any dislike of the coldness. 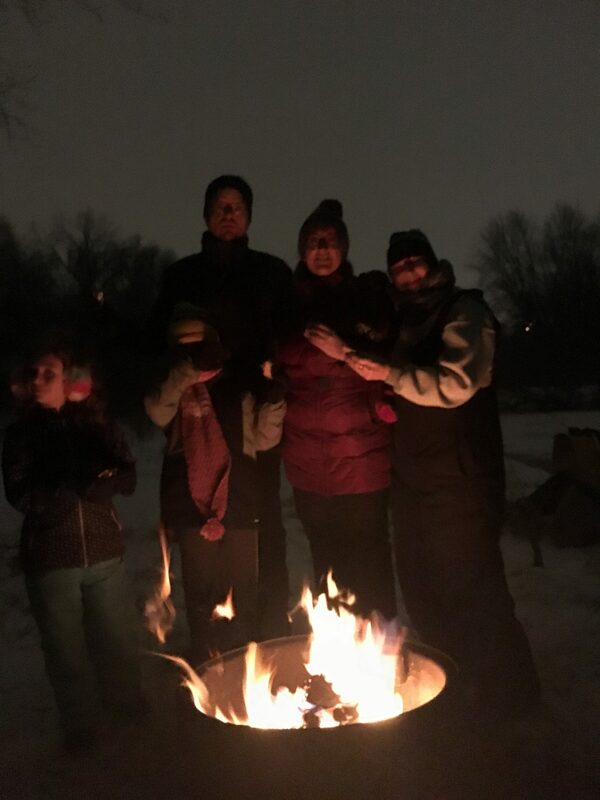 The night was perfect, and dare I say I look forward to more Winter activities in 2019. I’ve been struck recently by the quality of this community as learners and teachers. As powerful as this school’s three-fold mission of intergenerational programming and nature and art education is, what keeps this place satisfying, nurturing and exciting is the electric eagerness to learn. A teacher I was mentoring once told me, “Know me and appreciate me—and challenge me.” That’s pretty much it—for adults and children. We all need this from our environment and the people around us. A framework of respect and trust is at the heart of my own formation as a learner and a teacher. At the beginning of my teaching career, I had the privilege of working with Vivian Paley, master teacher and author, now retired. She was brilliant and funny, and was attuned to young children in a way I have never seen. She was also fearless, ready to try anything to support her young learners. In the afternoons after the children had left, she and I would talk about the day–what had gone well and what hadn’t. She actually relished revisiting the tough parts of the day. To paraphrase; “Give me a tough day anytime. I learn from those in a way I don’t when everything goes right.” We would strategize ways to rearrange “the doll corner,” as it was called back then, or new approaches to children who were struggling. The following morning she would come in, saying, “No, that won’t work. Let’s do this instead.” I learned that it was the teacher’s job to keep trying new ways to understand and support the children, not throw up our hands in frustration over the children’s behavior. Vivian treated me with the same patience and respect. When I told her at the end of our three years as a teaching team, that she had never once criticized or corrected me, she was shocked and said I must be mistaken. But she knew me as a learner, knew that I was self-critical and sensitive, and that I would learn best through kindness and faith in my own discernment. The children walk in the door eager to learn and be loved. They live in a constant state of trying to figure out how the world works. That process can be frustrating and overwhelming, since they have had so little experience with school, teachers, friends, schedules—life outside home. But teachers and parents are here to be their guides, and help create emotionally and physically safe spaces for discovery. 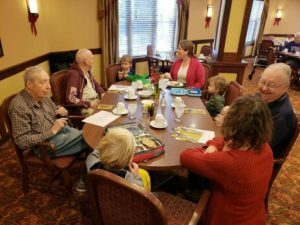 All Seasons staff has a particular focus of study each year and our monthly meetings and professional development days address related topics. This year we are learning about early childhood mental health issues. The increase in the identification of increased anxiety, attention deficit disorder, autism spectrum disorder and even depression in young children prompted our study. We’ve been reading relevant articles and books and listening to experts in the field. All Seasons parents of special needs children continue to be crucial resources. This fall we attended a related staff development workshop presented by Tina Feigal, noted parent coach. This week’s parent forum’s topic is “Mental Health and Building Resilience.” We’ll learn from parent Joe Robertson, an Inver Grove Heights police office experienced in community mental health, as well as hear about the latest research on the topic. All Seasons parents are no different. Our parent-teacher conferences and conversations on the fly have made it clear to us that you are all eager to discover what All Seasons has to offer. You ask: What is my daughter or son like as a school child? Do you know my child? What happens outside? In the studio? Upstairs with the grandmas and grandpas? As a school philosophy, how do you handle misbehavior/anger/sadness/fears/friendship issues? Some of you have asked about specific issues around parenting, pretend play, death and loss. We have offered resources that have been helpful to us or other parents. A mutual respect and trust is established as we learn together, just like what happens with the children. Lucky us, we’ve all landed at All Seasons, where the learning and teaching never ends. On November 2, when there was no school at All Seasons, our teaching staff had the privilege of attending a presentation by Tina Feigal, Parent Coach and Mental Health Professional. Ms. Feigal focused on how parents and teachers can best help children who have experienced some type of trauma. Trauma can be defined as “big trauma” such as abuse or neglect or “small trauma” such as overhearing their normally loving parents fight with each other. Children who experience either type of trauma tend to display challenging behaviors that can be difficult for parents and teachers to navigate. Ms. Feigal discussed how to support children when they exhibit these difficult behaviors, which as we all know, is truly all children at one time or another! She recommended that instead of giving children consequences for difficult behavior or focusing on punishment, parents and teachers should instead work to emotionally attune to the upset child and focus on strengthening their relationship. When children engage in their most challenging behaviors (crying, screaming, kicking, spitting, throwing, etc. ), they are using the part of their brain that is used for survival (the amygdala). The message their behavior is communicating is “I am afraid I am not safe.” During this time, a young developing brain is incapable of using the logical, thinking, prefrontal cortex part of the brain that oversees registering consequences. Children will simply not hear adults giving consequences and the adults are basically wasting their breath, becoming even more frustrated. What to do instead? When a child is stuck in the emotional state of fear, our job is guide them with love and to make them feel safe and seen. Sometimes that looks like a hug. Sometimes that looks like saying, “I see you” or “I’m here for you when you need me.” It is only after a child is calm and feels safe that they can use the parts of their brain that can make connections between their behaviors and the results. This is not to say we should do nothing and simply be passive observers waiting for a child’s next outburst. Parents and teachers should be active and proactive during calmer times by creating opportunities for future success. It feels so silly to do this at first – prescribed and phony, even. 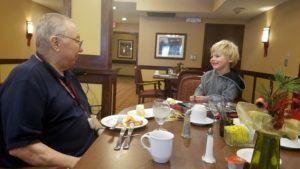 But consistency with these types of messages to children will form deep rut neural pathways in their little brains, permanent messages telling children “I am smart,” “I am kind,” “I am caring,” or “I am loved.” These “when you…I feel…because” messages are ways to essentially download success into their hearts. I have been using these types of statements more and more both when teaching here at All Seasons and at home with my own children. My daughter has always been the type to beam at any sort of praise. But these statements go beyond simple, pat praise. They provide specific descriptions of the type of behavior we want to see in our children. They describe the qualities and roles that all parents and teachers hope children will develop: helper, friend, problem solver, thinker, champion. It is important to note that Tina Feigal specifically stated that When you…I feel…because statements should only be used for positive input and NEVER for a negative interaction. It does more harm than anything else for a child to hear that they made someone feel sad, bad, or angry, even if they did indeed do something to elicit those emotions. So remember- only for good, positive, input! These statements won’t solve all the problem behaviors, but they will make it clear to children that they are good, they are seen, and they are loved. For more on Tina Feigal’s work, her books Pocket Coach for Parents and Present Moment Parenting are excellent resources for parents and teachers alike. © Copyright 2019 All Seasons Preschool All Rights Reserved.